4 Wheels - Road Tuning. 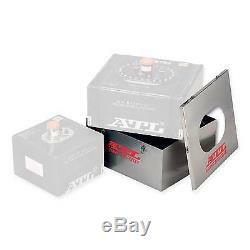 ATL Motorsport/Racing/Rally Fuel Saver Cell Alloy Container Suits 100 Litre Cell. In order to comply with race / rally regulations fuel cells which are fitted in the drivers compartment need to be covered. These alloy containers are designed to do just that. They are made to the correct size for each ATL saver cell and feature a removable lid which has a cutout for access to the top plate. Picture purely for illustration purposes only. Any subsequent orders can be delivered to an alternative address. ORDER NOTES - Due to the automated system we operate, we cannot guarantee to be able to view any notes or comments you add to your order. OVERSEAS ORDERS - Please be aware that we are unable to alter the value or description marked on orders destined overseas for the purposes of avoiding having to pay duty on your order. Our shop is designed to be fast, clear and easy to use. However, we want you to be confident that if you have any questions or queries regarding any of our listings, our dedicated team of experts are at the other end of a telephone or keyboard waiting to help. Express and guaranteed services will need to be selected and paid for at time of ordering. At JJC, we strive to keep feedback 100% positive. We do this by offering quality products and 1st class customer service. Our customers satisfaction is the most important thing to us at JJC. The item "ATL Motorsport/Racing/Rally Fuel Saver Cell Alloy Container Suits 100 Litre Cell" is in sale since Wednesday, March 23, 2016.